Rand Paul 2016: former Ron Paul aides now raising funds for Rand's run indicted for bribery scheme in 2012 primary. 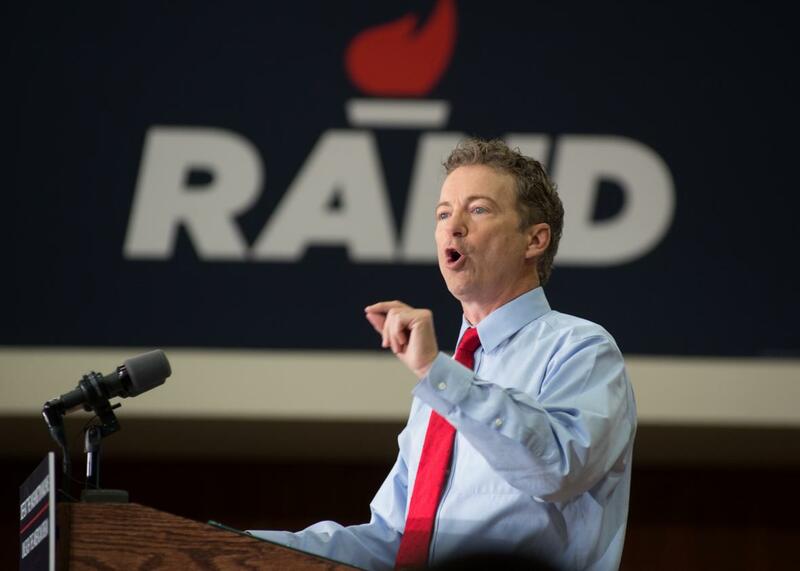 Sen. Rand Paul at the University of Iowa on April 10, 2015. Three former campaign aides to Rep. Ron Paul have been indicted for a scheme to bribe an Iowa lawmaker to endorse Paul in the run-up to the 2012 Iowa Caucus. CNN reports that John Tate and Jesse Benton, who now work raising super PAC donations to support Rand Paul’s campaign for president, are accused along with former Ron Paul staffer Dimitrios Kesari of charges including conspiracy and filing false reports with the Federal Election Commission. Former Iowa state Sen. Kent Sorenson, a Republican who initially worked for Minnesota Rep. Michele Bachmann in her bid for the 2012 GOP presidential nomination, later switched his endorsement to Ron Paul. The indictment alleges that Benton, Kesari, and Tate worked to secretly channel $73,000 to Sorenson, including payments made through a business owned by Kesari’s family. Prosecutors charge that the three Ron Paul aides conspired with Sorensen [in December 2011] to distribute successive payments to Sorensen, Bachmann’s Iowa campaign chair, through political committees to conceal the cash flow. Sorensen and Paul aides continually denied that he had been paid to endorse the Texas congressman, a charge leveled by a spurned Bachmann in the lead-up to the first-in-the-nation contest. News leaked of FBI and Federal Election Commission officials’ investigations in June 2013, according to the indictment. That September, prosecutors say Kesari flew to Nebraska to ask Sorensen to return the cash, which Sorensen refused to do. Through 2014, Benton and Tate repeatedly told authorities that they had not paid Sorensen for the endorsement, a cover up reflected in false records submitted to the FEC. Benton, who is married to Rand Paul’s niece, resigned his position as manager for the re-election campaign of then-Senate Minority Leader Mitch McConnell when Sorenson admitted to his part in the affair last summer.